On Sale £39.97 - all incl (No hidden extras). Need a New Housing Unit? 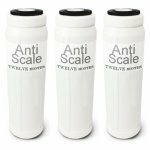 This top anti-scale taste and odour cartridge will replace any standard water filter cartridges that is 9 and three quarter inches length x 3 inches or less diameter. With a 1 inch aperture at either end. Please see Will it fit my existing water filter? If your existing filter looks anything like this - and you want to remove scale from furring up your kettle etc - then it can almost certainly be replaced by our specially made cartridge. (If not we guarantee your money back). Please Note: The price above is for the cartridge only. Depending on local water chemistry. 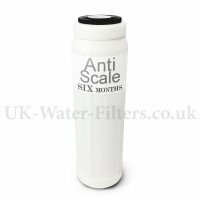 Please note that it's hard for us to be certain this filter will stop scale in your drinking water for the full 12 months. This is because there are thousands of local water treatment plants in the UK. Each has a unique water chemistry - which can change regularly. However rest assured that the cartridges do work well for the full 12 months for 95% plus of our customers. Even if you're in a particularly bad area the filter should last for 9 months plus. What can make a big difference is the flow rate of water going through the filter. The slower the better. You might need to reduce to 2 litres a minute. (This will fill your kettle for a cup of tea in a few seconds). To adjust the flow rate simply use a flow restrictor / shut off valve. If you don't already have one ask us and we'll send one for free with your new filter. (Usual price £6.97). You already have a water filter system but need a new housing unit for the cartridge to go inside. (So you keep your existing tap and connection to the water supply). 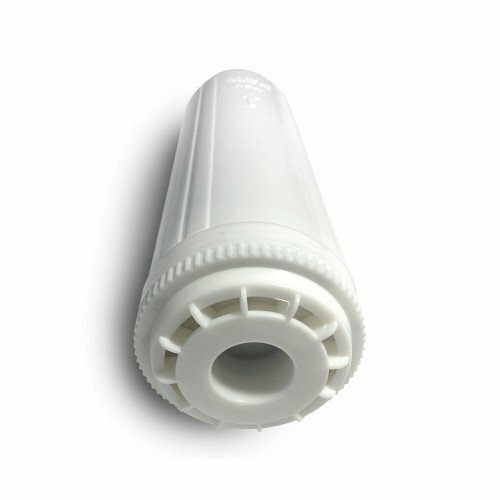 In this case you can buy a new filter housing unit with the cartridge for an additional £27. Please call us on 0800 009 6611 and we can arrange that for you. 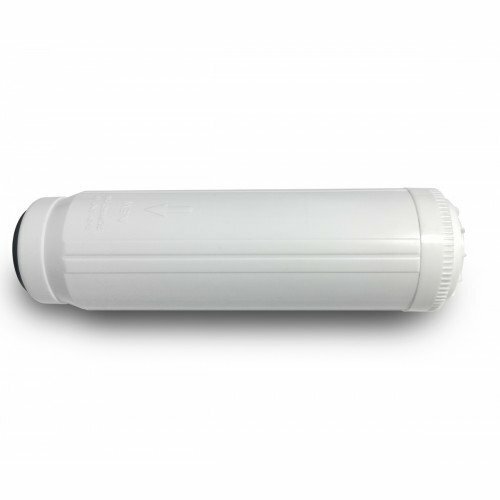 If you don't have a filter system at all - or want a whole new FILTER SYSTEM with a new tap and connection to the water supply click here. 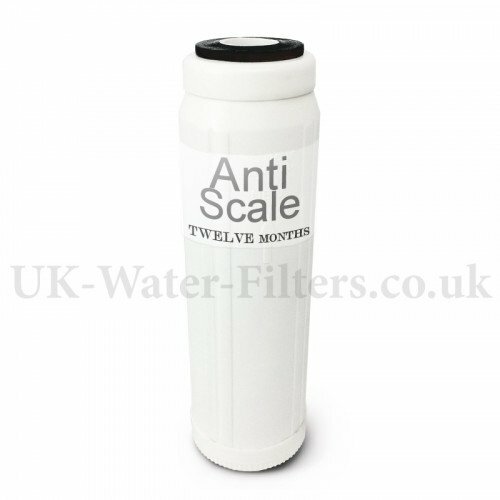 (When you've read enough about the filter system click through to the order page and select the anti scale option). The price of replacement cartridges varies depending on sales and so on. We guarantee you will get a special "customer loyalty rate" of at least the price you pay today. If for any reason you decide to return your purchase we promise you a no questions asked THREE MONTH Money Back Guarantee. Click here to read the "large print" about our Money Back Guarantee. Please order now to secure today's sale price. The ideal flow rate for maximum anti-scale performance is 2 litres / minute. However depending on your local water conditions you can increase this to 3 litres / minute. Bought and fitted two weeks ago. We have very hard water, after descaling evidence of scale usually on 1St or 2nd boil. Now with this fitted, wow, no scale at all, kettle clean and shiny!!! Would recommend, note however pipes/tube size if fitting to existing tap with separate water, they are not standard even though they advertise the tap on the site. Quick trip to halfords for joiners and jubilee clips and fixed. UK Water Filters gives a smooth excellent taste to our drinking water. The taste of a cuppa is that good we could not go back to drinking water without a filter. 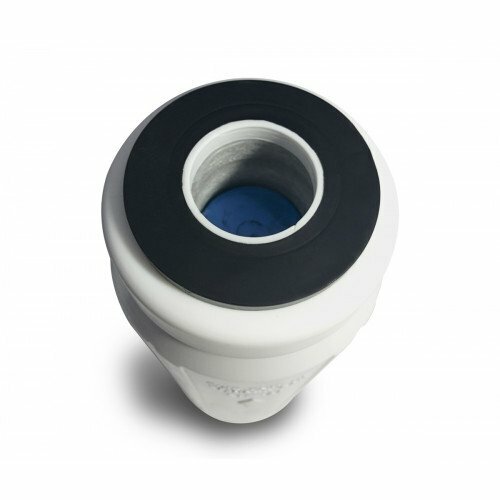 UK Water Filters are so easy to install and so easy to change the filter with no spillage of water. 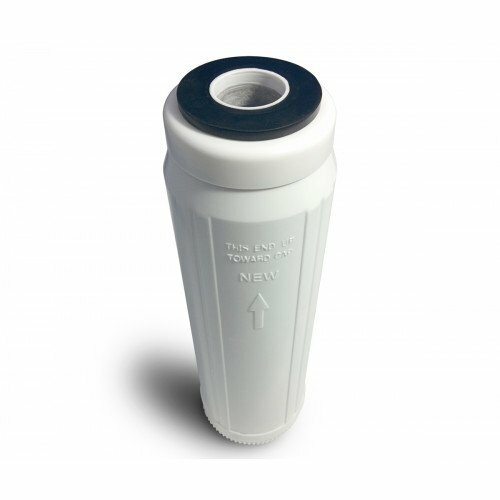 If anyone is thinking of changing to filtered water you will not be disappointed with UK Water Filters. Easy to fit easy to change. We at our home will always be using this tried and tested company. We have always bought the 6 months cartridge but now we have gone onto the 12 month cartridge. UK Water Filters are a lot cheaper than Brita Water Filters. Thank you so much, Dave. the water filter arrived in time for my wife's birthday - that's the day when I install the water filter, making it a doubly special occasion. I can fit the filter whilst making her her special birthday breakfast! All went well. I remembered to put a bowl under the filter housing to catch the drips which always occur, despite turning off the isolator valve and opening the tap to relieve the pressure. I unscrewed the housing, removed the old filter, put a quick wipe of silicone grease around the o-ring, dropped in the new filter and then put it all back together again. Checking that there were no drips after turning on the isolator valve, I opened the tap, drew off a sinkful and then retired upstairs with the breakfast on a tray. I look forward to another year of nice drinking water. Very efficient & friendly. Provide good quality at low prices. This review was also placed on MyLocalServices the independent review site. I have found this company very helpful & will continue to use them for anything connected to my undersink water filter. Nothing is too much trouble for them. Have been very happy with "UKWater Filters" always very helpful originally bought 6mth filter to replace Brita filter did not notice any difference except price, this time have gone for 12mth filter and brilliant easy to fit and water tastes good will defiantly be buying next replacement may even buy two and save even more. 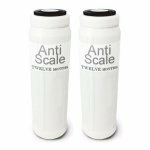 Recently ordered under sink annual anti scale + taste filter system. What a superb system this is. Easy to fit and very helpful people to deal with. I wanted to change the supplied tap for the designer version... no problem, just paid the difference! The water quality and taste is beyond belief. So happy; drinking plenty of delicious water now. Do not hesitate if you are thinking about fitting a water filter. You know where to come! Have been using filters from UK Water Filters for a while now. The filter arrived soon after I placed the order, it was easy to fit and is working great. Would certainly recommend. The filter arrived quickly and was easy to install. We have the filter on 15mm mains feed, but throttled back to give the recommended 3ltr / minute. It reduces scaling in sink, saucepans and kettle considerably. Gives the water a distinct sweet taste, but not unpleasant. Be interesting to see if it lasts a year. So far so good. Have been using filters from UK Water Filters for some years now (once I realised how much cheaper they were than the OEM ones and without any loss of functionality). Getting the automatic reminder to buy again is a really good touch. I purchased this product a year ago and it has been very good. The water has stayed clean and it has helped reduce the lime scale build up in the kettle. I was impressed with your follow up service prompting me to buy a new filter - not often I appreciate sales emails like that. Thanks also for the sheet of instructions because it was good know to anticipate problems unscrewing the filter housing. It was initially impossible, but I eventually secured it upside down in a vice and used an oil filter strap wrench to shift it, and with that combination of tools the job was a piece of cake. Brilliant, bought a 6 month filter and it was so good I bought two one year super taste (under sink home filters). Sorry I didnt find UK Filters sooner. The cost of bottled water was terrible, as was the awful taste in my unfiltered tap water. Now, its a joy to drink tap water, which is something I have avoided for years, the filter system, tap etc is GREAT. If you want good water, don't hesitate to buy from UK Water Filters, its easy to fit your own undersink system and if you can't, get someone else to do it for you. Either way, these filters are brilliant, you'll probably never drink normal unfiltered tapwater again. Take the plunge and enjoy! This is our second filter, this time we have gone for the 12 month solution. We are a large family and therefore heavy water users so it is unlikely to last the full 12 months, however the same was true of the Brita filter which it initially replaced. These are a fraction of the price and we have never been able to tell the difference. Our kettle is always clean. We even top up the fridge dispenser with water negating the need for the push in filter in the fridge, double savings really. I also made a call to check the one year filter compatible and the sales person was polite and helpful. I have previously bought the 6 months cartridge and was very pleased with it. I am now trying out the 'lasts 1-year' cartridge. Have used filters from UK Water Filters for some time now. Have a reminder every year and service is pay today, filter tomorrow!!! Excellent service. Wouldn't,t be without the filter in our area, the water is terrible without one. Once again, many thanks!! I've been using one of these filters now for a couple of years and would not now be without one. The water purity is excellent, as is the customer service and now that the cartridges are recyclable we are helping the environment. Great product.